Will the mighty Cadillac's continue Thar Stranglehold upon Day-Toners' High Banks? ROLEX 24: Can Somebody Other than Cadillac claim This Year's Daytona 24hr Winner's Wrist piece? As previously noted, IMSA has split the Prototypes Class into two separate entities, paving the way to ensure that the Daytona Prototype International (DPi) competitors will be the fastest category overall, Hence ensuring that the European-spec LMP2 contingent no longer will threaten for an upset Rolex 24 victory ahead of the Manufacturer based runners. Surely most IndyCar Fans, Whale' at least those tunin' in. Will have Thar Attenzione squarely focused upon El Capitano's, nee Roger Penske's latest foray into Sports Car racing, with his two car All Star lineup featuring two of Indy Cars past Biggest names, i.e. ; Castroneves & Montoya. While in typical Penske tradition, Thars' NO weak links in the Driver selections, as "Symone Pagenoe," nee Pageantry, aka simon Pagenaud remains, whilst thou Graminator', nee Graham Rahal, due to his lanky 6ft 3in frame has bowed out in favour of IndyCar HotSchue Alexander Rossi, who along with Pagenaud will contest the Endurance rounds this year. Meanwhile, Monty and Hulio's regular season co-drivers aren't slouches, with both Ricky Taylor and Dane Cameron being past series championship winners. Once again, the defending Rolex 24 race Winner Hails from the Caddy' stables, this time being the No. 5 "Mustang Sally;" Err sampling Action Express Racing (AXR) Cadilac VR DPi. Yet ARSE-Sumedly, Mucho Attenzione will be focused upon the #10 Wayne Taylor Racing, but not on its normal chauffeurs Renger van der Zande and Jordan Taylor. Nope, instead that Media Darling; Uhm I meant Fernando Alonso, Ci! With the team's forth driver being another Formula 1 refugee who I fondly call 'em "K-Squared," nee Kamui Kobayashi. Similarly, Action Express Racing's (AXR) two car squad is loaded for Bear, albeit with slightly Tweaked Driver Rosters. Most notably being the addition of new Fulltime Pilote Pipo Derani, who needed to find new employment after the demise of (ESM) Extreme Speed Motorsports. As Yuhs should never count out AXR, who after all have won three consecutive Daytona Prototype (DP) class titles between 2014-16, and four of the last five years Outright! (2018) Twice with the formable Duo of JB', aka João Barbosa and Christian Fittipaldi, whom are both triple Rolex 24 winners! With Eric Curran having anchored the Seester' #31 Whelen Engineering Championship winning AXR mount. Claiming the title with Dane Cameron in 2016, and last year with former F1 Driver Felipe Nasr. As Curran will just run the Enduros' this season. Then Thars' two brand new Caddy' runners, as JDC Miller Motorsports steps up from LMP2 status last year, and will fill the field with its No's 84-85 tandem, with Rubino', nee Rubens Barrichello being it's Marquee Driver. Indy Cars Juncos Racing is a brand new entity in Sports Car racing, with its shiny new No. 50 Cadd-OhLacc' featuring three Rolex 24 rookies, comprising of IndyCar Drivers Kyle Kiser and Rene Binder. Along with Argentina's Agustín Canapino, as Will Owen is the only one of the Quartet with previous Daytona 24hrs experience. Once again, the little car that could? Led thou way in the Roar Before the Rolex 24's pre Qualie' Show, when Pitlane spaces & Garage selections are decided, with Oliver Jarvis throwing down the Gauntlet with a Mega lap time of 1m33.398s! Unofficially Breaking P.J. Jones 1993 record time aboard the all Conquering AAR Eagle MKIII. But the biggest news for Mazda Team Joest is the Off-season's Technical Department's retooling, most notably with the addition of spurned IndyCar Newbie' Engineer Leena Gade, who'll Engineer the team's No. 77 entry. Meanwhile the Driver Roster's almost completely intact, from last year, with the only changes being Olivier Pla replacing Indy Cars Ed Carpenter Racing's Spencer Pigot. Along with the addition of Timo Bernhard, a past 24 Heurs du Mans winner for Porsche, albeit it seems odd that both entries don't sport four drivers apiece. As Bernhard and Pla will serve as the Endurance round Drivers, whilst Rast's involvement could be limited due to his Deutsche Tourenwagen Masters commitments. The Good News is that Thars still a Nissan DPi entry contesting the IMSA Weathertech SportsCar Championship this year. 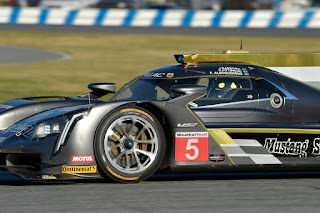 But unfortunately, it's not being run by Extreme Speed Motorsports, (ESM) who along with IMSA lost their longtime financial backer Tequila Patron at the end of last year. But good for CORE Autosport for upgrading its Prototype programme this season by stepping up to the Top-flight DPi class. As once again the #54 features a pair 'O former Audi LMP1 Men, nee Messer's Duvall & Dumas at its controls for the Rolex 24 complimenting Messer's Benet & Brown.